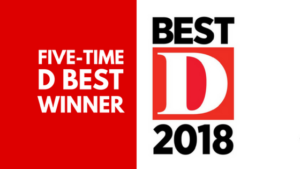 COMPLETE FINANCIAL GROUP congratulates Jeremy David on being named Best Insurance Agent of 2018 by D Magazine. More than 170 agents from across the Dallas/Fort Worth Metroplex were recognized, and Jeremy David is honored to be included for the fifth year. Subscribers and customers were able to nominate one agent they have worked with, based on overall satisfaction and whether or not they would recommend that agent to others. Real estate agents, insurance agents, and mortgage professionals were able to nominate three agents they have worked with closely. Once the feedback was received, D Magazine then screened each nominee with the Texas Real Estate Commission, Texas Department of Savings and Mortgage Lending, and Texas Department of Insurance databases. Congratulations to Jeremy David on this outstanding accomplishment! Complete Financial Group has been meeting the insurance needs since 2005. The Mission of Complete Financial Group is to provide excellent service through teamwork, dedication, and hard work. They strive to be the best independent agency in Texas and work to prove their experience and knowledge each time they work with a new or existing client. They take the time to learn about each customer’s circumstances, identify their needs, and develop a comprehensive insurance program. To learn more, visit completefg.com. Every year, the D Magazine’s editorial research division surveys more than 15,000 recent homebuyers and members of the real estate, mortgage, and insurance communities to identify outstanding agents for public recognition. Winners are selected for excellence in customer service, integrity, market knowledge, and overall satisfaction. Nominees are vetted for licensing and disciplinary status, and winners are announced in the July issue.